What to do with all of those empty plastic water bottles? Turns out that the nickel deposit laws passed in many states around the country doesn’t usually cover bottled water — just beer and carbonated beverages. In the 1970s, water in plastic bottles wasn’t really an issue that anyone imagined. Bottle bills are still surprisingly good at inspiring recycling and reducing litter. But, though they are idiosyncratic in every state, the vast majority of the laws share one colossal, unanticipated flaw: they place a deposit on beer and carbonated beverages only. 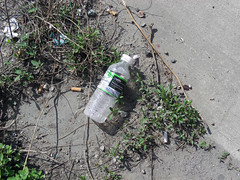 The bottle billâ€™s scope, and to some extent the very vision of a more waste-conscious world that first motivated it, has been swiftly trivialized by the ubiquity of bottled water. This year, Americans will drink more than 30 billion single-serving bottles of water. Oregonians will throw out about 170 million empty ones. Those same bottles, filled with something fizzy, would carry nickel deposits. â€œThat was the stupidest thing we ever did,â€ says a veteran of the original Oregon campaign. The laws were written in a different era, a less health-obsessed one, when drinking out of a bottle or can meant drinking beer or soda. If bottled water, teas, juices and energy drinks existed at all, they were quaintly called â€œnew-age beverages.â€ (â€œIn the late â€™70s,â€ one bottled-water executive urged me to keep in mind, â€œno one was putting on little shorts and running in the streets.â€) Bottled water, Berger says, â€œis whatâ€™s truly different from 1971,â€ which is why she and others are battling to expand their bottle bills to include it. From there, proposals often seek to fix a mess of other unanticipated dysfunctions and complaints. For starters, no state had the foresight to require its nickel deposit be adjusted for inflation. That nickel is now worth about a penny in 1971 terms, and redemption rates have depressed â€” except in Michigan, the only state with a dime deposit, where the rate remains 97 percent. Other states have tried to move to a dime. Whatâ€™s more, in most states, if we toss the can, or even if we dutifully put it in our curbside recycling, our nickel quietly remains with the beverage-distributing company to which we first paid it. This year, the Bigger Better Bottle Bill campaign in New York is making its sixth attempt to redirect those unclaimed deposits â€” estimated at $100 million each year â€” into a state environmental fund. â€œItâ€™s the peopleâ€™s nickel,â€ says Judith Enck, Governor Spitzerâ€™s deputy secretary for the environment.